Some stories are so enthralling they deserve to be retold generation after generation. The wreck in 1815 of the Connecticut merchant ship, Commerce, and the subsequent ordeal of its crew in the Sahara Desert, is one such story. King’s version, drawn from two separate first person accounts of the Commerce's crew, offers a page-turning blend of science, history, and classic adventure. In 1815 Captain James Riley and the crew of the United States merchant ship Commerce set sail from Connecticut for Gibraltar. After stops in New Orleans and Gibraltar, the ship falls off course en route to the Canary Islands and ultimately wrecks near Cape Bojador, off the coast of Northern Africa. After the men survive the first predations of the nomads on the shore, they meander along the coast looking for a way inland as their supplies dwindle. Eventually, with hopes of getting food and water,they submit themselves to be enslaved and dragged eight hundred miles across the hot and hostile Sahara Desert. King embellishes this compelling narrative throughout with scientific and historical material explaining the origins of the camel, the market for English and American slaves, and the stages of dehydration. He also humanizes the Sahrawi with background on the tribes and on the lives of Hamet and Seid. 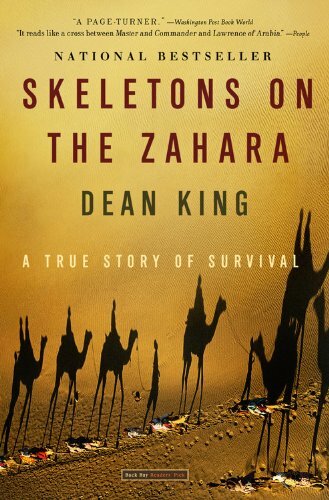 This material, doled out in sufficient amounts to enrich the story without derailing it makes Skeletons on the Zahara a perfectly entertaining bit of history that feels like a guilty pleasure. I have to thank Dean King for unearthing the dusty memoir and reintroducing the story to a new generation of readers. Almost two centuries later, the adventure still feels fresh and new, as it is at its heart a timeless story about bravery and endurance. Even though I know that the captain survived the ordeal, as evident from the publication of his memoir, and I couldn't help jumping to the epilogue, the excellent narration enticed me like a good mystery. Captain Riley had made the necessary but nonetheless false claim that he knew friends in Morocco who would pay for his ransom, at a time when the young America was far from the superpower it is today... the Arabs would not know about the new country, nor did the country had any counsel in Morocco. As they neared Morocco I couldn't help worrying what would happen when the lie was exposed. I had great admiration for Riley, and also for Hamet, both very honorable men. (Well, Hamet did do some not quite noble thing, but he was still a hero in my eyes.) It saddened me also that for some of the sailors, they could have had a chance to freedom, and home, but for the price of one measly blanket. The author did a great job not only in the fine retelling of the memoir, but also in prompting readers to contemplate on various issues. This is now sent to CrazyDutchWoman, who has this on her wishlist for a long while. OMG. Guess who made me cry? Azuki!! I am sitting here playing Final Fantasy on my playstation, and then the bell rings. I think "who can that be?" Is it 18.30 and I do not expect anyone. I see a guy standing outside with a package in his hand (not his package fortunately ;) ). immediately think it must be for the neighbours. I open the door and he says this is for you and then I see the big bookcrossing letters on it! Yee Haw!!!! Inside I look and it has been so long since I've last gotten a surprise rabck, I see it is from Hongkong! Wow How exciting. Then I open the package and when I see a book I really want to read in there. beautiful copy of Skeletons on the Zahara which is been on my wish list for ages, my eyes start to well up. Then there is another book in it, another wish list book, I really really wanted. Bare Necessity. Thanks azuki. You are such a sweetheart. it feels like it is Christmas already! Well.This book was definitely worth the wait. What a fantastic read! After the first 5 to 10 dry pages it got so that I could not stop reading. Right now I am reading another book like this one, survival book, this time on my kindle, so maybe that is why it differs, cause what I really liked about Dean King's book was the amount of notes, all the little maps spread into the book and all the info. It was all perfect really. Not too much and not too little. Even if you do not care about history books I am sure you would love this one. It reads like a thriller! When I was nearly done I had a hard time saying goodbye and I hope the other books I have in this genre will be just as good, but it is a hard act to follow!